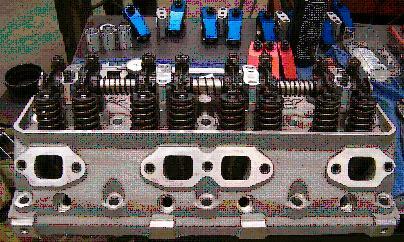 The much awaited for Mummert aluminum cylinder heads for the 292/312 Ford Y-Block engines are now a reality and have been tested on the DTS engine dynamometer. With no modifications these new heads were found to be worth a solid 56 horsepower increase over the stock “G’ heads with only the heads being swapped out on the test engine. The surrounding parts such as intake manifold, rockers, and carburetor remained the same. These new heads easily outperform the stock ‘G’ heads at the beginning of the test range (2500 rpms) and then simply run away at the higher rpms. 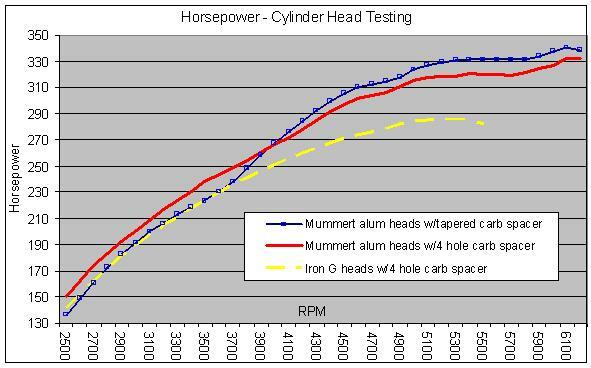 Where the horsepower on the original G heads peaked out at 5300 rpms on the test engine, the aluminum heads peak at 6100-6200 rpms. What’s really impressive is that these new heads were ran in their ‘out of the box’ condition with absolutely no tweaking being performed on them before testing. 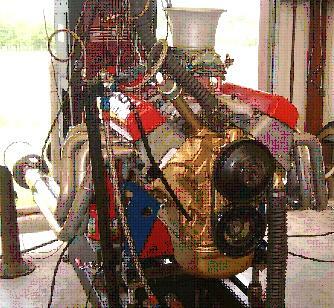 The test engine ended up with 340+ horsepower with the aluminum heads in a “just changed the heads” test. Summarized, 1957 supercharger performance is now available without having to run the supercharger. Here are some details on the test engine. It’s the same engine that has been used for several other tests so the optimum tuning combination using the stock unported G heads has been pretty well sorted out. The engine itself is a +060 over 312 Ford Ybock, the cast flattop pistons are 0.025” in the hole, an unmodified Mummert dual plane aluminum intake manifold, a 2” carb spacer, and a 750cfm vacuum secondary Holley are being used. The iron heads are a set of unposted G’s that have new valves, a decent valve job, a 0.025” mill to clean up the decks and with only minimal cleanup being done to the ports themselves. The calculated compression ratio with the iron heads is 9.2:1. The camshaft is a Crower Monarch grind with 282° adv duration, 238° @ 0.050” duration, ground on 110° lobe centers, installed 2° advanced (108° intake lobe centerline), and 0.435” lift at the valve with 1.54:1 rockers. Valve lash was maintained at 0.019” hot throughout the testing regimen. The aluminum heads were supplied with the combustion chamber volumes being right at 60cc. The iron heads after milling were 65.7cc. The smaller combustion chambers in the aluminum heads boosted the compression ratio to 9.8:1 which is just enough to offset any potential horsepower loss that is realized by the use of aluminum. Aluminum is a less efficient material than iron when it comes to combustion chamber efficiency so the increase in compression ratio with aluminum is necessary to realize the full benefit from port improvements and combustion chamber design. supplied rocker arm pedestals 0.080” on one side only which solved that issue. This modification has been passed back on to John Mummert to determine if adjustments are required on future rocker arm stands that are being supplied with subsequent orders of heads. Other than these two changes, the heads bolted in place using ARP 7/16” head bolts and Best Gasket head gaskets without any other issues. Autolite #3924 spark plugs gapped at 0.035” were found to be optimum. The tuneup for the aluminum heads required less total timing and leaner fuel mixtures to optimize the power levels. Where the iron head tuneup had already been optimized using 38°-40° total timing, the aluminum heads were initially tested with 32°-33° total timing. 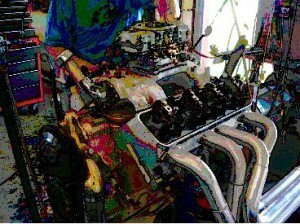 With the 1.54:1 rockers, the iron heads made 285.1HP @ 5300 rpms and 336.4 lbft torque @ 3400 rpms. 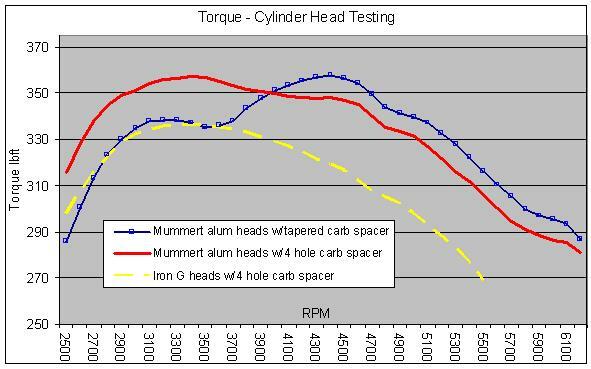 The peak numbers for the aluminum heads were 340.6HP @ 6100 rpms and 357.5 lbft torque at 4400 rpms. But it’s not all about peak numbers either. The aluminum heads are also strong on the bottom end of the scale. the two different carburetor spacer designs as used in the test. Before removing the heads from the test engine, a set of 1.6:1 roller rocker arms are installed and this results in another significant step up in performance. A variety of intake manifolds are also tested just to see how these heads respond to some of the older intake manifolds that are still being widely used today. Among these are the Edelbrock #573 3X2 setup that was deemed the best performer in the recent 3X2 intake test as well as a factory 1957 ECG-D dual quad intake with a pair of factory dual quad Teapots. More on this in the next article. Until then, happy motoring. Ted Eaton. Addendum: It was found at the end of the intake manifold testing session that the oem damper ring on the 312 dyno mule engine had slipped giving erroneous values in regards to the ignition timing settings. Testing on the EMC engine found 38° total timing to be optimum on that particular combination. Previous PostFord Y-Block Aluminum Head Testing Part IINext PostThe 2010 EMC Y-Block Entry Breaks The 500HP Mark (on pump gas)! !